The boy, the boom and Earthshock (1982) | Randomwhoness: a Doctor Who blog by Johnny Spandrell. Sampling stories in random order. The accepted wisdom about Peter Davison’s first year of Doctor Who goes something like this. The production team realised that having three companions was too many, so one had to go. And the obvious choice was Matthew Waterhouse’s Adric, because he was the weakest of the three. I’ve always been a little skeptical of this reading. Firstly, if the production team really felt that three companions were too many, why did they go straight back to that line up, albeit briefly, the following season? (Twice, if you include Kamelion as a companion). I suspect that the reservations about having three companions (which as I’ve noted before I don’t automatically share) came long after the fact and was influenced more by critiques some years after broadcast, rather than at the time. 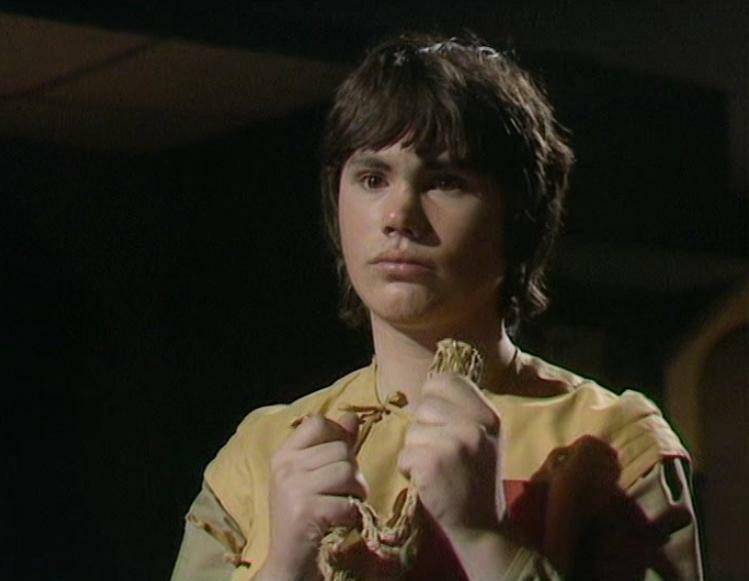 Secondly, because fandom now generally looks back at Adric with much criticism and disdain, it seems clear that he would be the prime candidate for the chop. I think it could actually have been a much closer run thing and that one of his fellow travellers, Nyssa or Tegan, may well have taken his place. Sarah Sutton’s Nyssa had been a last minute addition to the line up and even Janet Fielding’s Tegan was initially only guaranteed for the change over between Doctors. I suspect that the now popular view of Adric as a poorly performed and annoying companion was not widely held at the time. Certainly, I can’t remember much poor press about him during the 80s. It was only later we all seemed to unite in hatred of the poor doomed boy. Let’s head back a bit and consider Adric’s origins. Before I started my random trek through Who, I completed a marathon viewing of each story in order. Eventually, as must inevitably happen, I reached season 17’s The Horns of Nimon. One thing that struck me was the small group of youngsters playing the tributes for Aneth. Suddenly, Doctor Who had teenagers in it. Something it hadn’t had since the 1960s. It was arresting to realise that a series with clear appeal to a young audience, had until then resolutely avoided representing these viewers on screen. One of those tributes was a young man called Seth, played by Simon Gipps-Kent. Seth teams up with Romana for much of the story and they form an effective partnership. Perhaps Gipps-Kent caught the eye of soon-to-be producer John Nathan-Turner (stop it), and the thought crossed his mind for a more permanent role for a young, male character in the show. So in short, we might have The Horns of Nimon to thank for Adric. Whatever the character’s genesis, Matthew Waterhouse, a fledgling young actor of 18, was thrust into the highly fraught world of making Doctor Who, complete with the moody and unpredictable Tom Baker who was having a tempestuous affair with co-star Lalla Ward. Stormy waters for anyone to navigate let alone a kid of limited experience and nous. He’s out of place so much in this TARDIS crew because despite what Nathan-Turner said about it being a team of know alls complete witha robot dog, there was nothing wrong with the existing line up. It fact, it was a brilliant team. It didn’t need an Adric. Then there’s the added complication highlighted by The Horns of Nimon. Teenagers in Doctor Who were highly unusual. No one knew how to treat them. Certainly not the writers who failed to build a consistent and compelling character around Adric. Eccentric Doctors and glamorous female companions are part of the series’ DNA. Quite where a young boy, let alone one who was an uncomfortable mix of Artful Dodger and child prodigy, fitted in the series was unclear. So let’s not kid ourselves that playing Adric was in any way easy. The odds were stacked against Waterhouse from the start and the material he got was highly variable. Try, for instance, saying any of Adric’s lines from Four to Doomsday convincingly. Now imagine having to say them convincingly while wearing green and yellow space pyjamas. His finest moments are at the end of the Tom Baker era, The Keeper of Traken and Logopolis. Here Adric is the primary companion, smart and personable and Waterhouse gets his best material. But once Baker turns to Davison, there’s much more competition for screen time, characterisation and dialogue. There’s an exciting new Doctor for a start, plus two attractive new girls, one of whom’s a technical whiz like Adric once was. As a result, our boy wonder slips into sulky teenagerdom. By the time we get to Earthshock, his time is up. And he’s not just dropped off on another planet or left behind with a new beau, he’s blown up. As emphatic an exit as you can get. Even Doctor Who‘s time travel format won’t allow him a return visit. In the next story when Tegan suggests just that, the Doctor rules it out utterly. The boy’s never coming back. You occasionally read someone suggesting naïveté on behalf of the production team in seeking to elicit an emotional kick from the audience by killing off the character they had the least affection for. Again, I think it’s a revisionist view. I think at the time, any young people watching, be they boys and girls, would have been deeply traumatised by Adric’s demise. In fact, we know that was the case from a number of Who notables interviewed for the DVD doco Putting the shock into Earthshock. You don’t have to like Adric to be touched by his death. In fact, there’s the added pang of guilt in someone dying about whom you were never very nice. A freshed faced young Steven Moffat, as yet unravaged by years of making Doctor Who, appears in that documentary to gently criticise those who made Doctor Who. Why, he wonders, did sci-fi shows insist on including boy geniuses? Well, I suspect they thought they were providing an audience identification figure to spotty, awkward teenage boys who made up a large proportion of the audience. But they forgot a crucial point: spotty, awkward teenage boys generally have chronically low self esteem. The thing they hate doing most is looking in the mirror. But as I say, I think those boys’ hatred of Adric came later, when they’d all grown up, become sophisticated and successful, and left their spotty, awkward past behind. Revisiting Adric’s adventures would be like looking back on awful family photos of themselves. That’s the guy they used to be? What a loser. That boy’s never coming back. ADVENTURES IN SUBTITLING: “The year is 2526,” Adric announces, “in the time scale you call anno domino” apparently. Why do I suddenly feel like pizza? SACRIFICIAL BLAM! No points for guessing. NEXT TIME: I used to know an ancient remedy for mad dogs. We stick with the Doctor, Adric and Nyssa to meet The Keeper of Traken.